Barrie is a city in Central Ontario, Canada, on the shores of Kempenfelt Bay, the western arm of Lake Simcoe. Although located in Simcoe County, the city is politically independent. It is part of the Huronia region of Central Ontario. 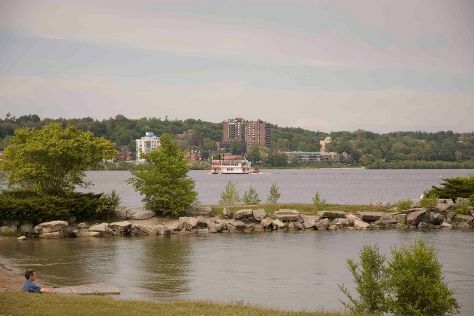 Barrie is within the northern part of the Greater Golden Horseshoe, a densely populated and industrialized region of Ontario.In 2011 census, the city's population was originally reported as 135,711, making it the 34th largest in Canada. The city's 2011 population was subsequently revised to 136,063. The Barrie census metropolitan area (CMA) had a population of 187,013 residents, making it the 21st largest CMA in Canada.HistoryAt its inception, Barrie was an establishment of houses and warehouses at the foot of the Nine Mile Portage from Kempenfelt Bay to Fort Willow, an aboriginal transportation route that existed centuries before Europeans came to Simcoe County. The portage linked Kempenfelt Bay through Willow Creek, connecting Lake Simcoe to the Nottawasaga River which flows into Georgian Bay off Lake Huron.Barrie played an integral role in the War of 1812. During the War, the city became a supply depot for British forces, and in addition, the Nine Mile Portage was adopted by the British Military as a key piece of their supply line which provided a strategic path for communication, personnel, and vital supplies and equipment to and from Fort Willow and Georgian Bay / Lake Huron. Today, the Nine Mile Portage is marked by signs along roads in Barrie and in Springwater Township. You can follow the scenic path from Memorial Square all the way to Fort Willow. Barrie is in Ontario. Use our Canada trip itinerary planner to arrange your visit to Barrie and any other destinations in Canada that take your fancy.